Hello, my name is Joe Sparks. I make digitial media for your amusement. My new announcement list, please subscribe. Almost nothing has changed on this site for MANY years! I am keeping it up as a time capsule for now! Radiskull & Devil Doll Comic book, now a SERIES. No longer just a test issue! It looks like the first R&DD comic did well enough to warrant a real series.Devil's Due is the publisher, how appropriate! Me, "Company Leader" @ Macromedia! See me on video in THE MACROMEDIA STORY. In this very innovative presentation, you'll catch me chatting about the early days of the company, the industry, & the software. 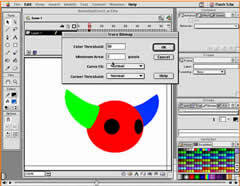 I go way back with Macromedia (the makers of Flash MX ). See my BIO for extra details about this. Join my list, and every month or so, I will send updates about my work, including any news on Radiskull & Devil Doll and Dicky & Jackie. RADISKULL & DEVIL DOLL: THE BOOK! Want to make your own cartoons? 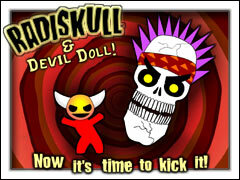 Or maybe you just want to learn more about how I put Radiskull & Devil Doll together! If so, check this out! I made my first Flash animation training CD-ROM, now shipping! © 2000-2018 Joe Sparks. ALL RIGHTS RESERVED. Names & Images of "Radiskll & Devil Doll" "Dicky & Jackie" and "Joe Sparks" are the trademarks of Joe Sparks.